Since 1976, women have always been a strong foundation of the Habitat for Humanity (HFH) program. Millard Fuller and his wife Linda were the founders of HFH, and Linda was involved in the movement and rapidly changing climate of affordable housing. Of the nearly 1,500 affiliates across the country, a large percentage of them are managed by women taking on leadership roles. Today, women from all around the world are putting on their work boots and taking up projects to better their neighborhoods and provide services to those in need. In 1991 a group of women in Charlotte, N.C. completed the first women-built HFH house. With this event, the seeds for HFH’s Women Build program were planted. In 1997 as part of the Jimmy & Rosalynn Carter Work Project, U.S. first lady Hillary Clinton, Kentucky first lady Libby Jones, and Oklahoma first lady Cathy Keating participated in a Women Build. As it continued to grow in popularity, large numbers of women were feeling more welcome on the job site and began to work closely with the men using their teaching skills to further enhance their contribution. In 1998, Habitat for Humanity International (HFHI) formed a Women Build department and the Women Build program became an official HFHI initiative. By 2001 the First Ladies Build was hosted, and first ladies from all 50 states joined to build houses across the country. In 2003 Lowe’s signed on as Women Build’s underwriter. Since 2003, the program has more than doubled in size. Even more positive effects were shown through 2006 and 2007 when “First Families Building Homes Across America” united women volunteers with governors’ spouses and local and statewide leaders to construct Habitat homes in every U.S. state and District of Columbia. By 2008-2009 Lowe’s sponsored National Women Build Week, held in the days leading up to Mother’s Day. About 6,000 women volunteers participated at more than 150 Habitat affiliates across the United States. 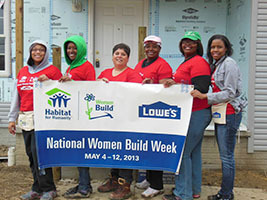 National Women Build Week gained even more momentum in 2009, with 700 volunteers joining in at more than 200 Habitat affiliates, working to build 252 homes. By 2010 Women Build volunteers had built more than 1,650 houses and the stage was set for 6 Women Build Global Village teams to travel internationally and assist. More staggering is that by the end of 2012, more than 40,000 women had worked during National Women Build Week, with more than 300 Habitat affiliates around the globe. The program continues to grow across international borders, empowering women everywhere to address poverty-housing for themselves, their families and their neighbors. Dozens of international Women Builds have taken place, and the program continues to direct financial assistance to women-led projects worldwide. For the local Habitat affiliate in Summit County, Ohio there have been 2 homes completed which were entirely funded and mostly constructed by women. In 2002 a home on Markle Street was completed and in 2008 a home on Noble Avenue was completed. Women were involved in all aspects of construction as well as the fundraising to generate the dollars needed to purchase the materials to build the home. In 2008 the Summit County affiliate joined with HFHI to become a Women Build partner. 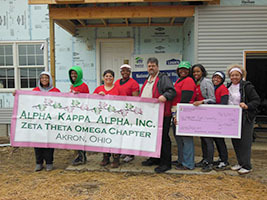 Each year since then, they’ve participated in the one day challenge for Women Build, with its local supporter Alpha Kappa Alpha Zeta Thega Omega (AKA) alumni chapter to earn a $5,000 Lowe’s supported gift card for material purchases. The women of AKA come out in full force to show their muscle on the Saturday before Mother’s Day and can be counted on each year to support the build day with a $1,000 contribution. AKA Alumni President Mary Wright gathers her group, puts on her work boots, gloves, hard hat and goggles every year and gets down to business with the tasks needed for the day. The women have done drywall, painting, landscaping, insulation, framing and finally, in 2013, siding, which is something they have wanted to do for a couple years. They are able to take skills they learn at the Habitat site and try projects at their own homes. That is the beauty of women learning construction skills at the Habitat site. 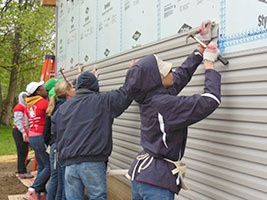 The Summit County affiliate continues to hold Women Build days throughout the year. It is our goal to host 6 per year where women can gather groups together to come out and build together. There is much to be said about the bonding that takes place on a Habitat work site, and whether you are an X, or Y chromosome, you can use your hands to further the dreams of a family in need of simple, decent and affordable homeownership. For more information on Women Build or any other programs offered by the local Summit County Habitat for Humanity visit www.hfhsummitcounty.org. To learn more about national programs, or find an affiliate near you, visit www.habitat.org.